Shizuku's best friend. She enjoys singing and gossip. 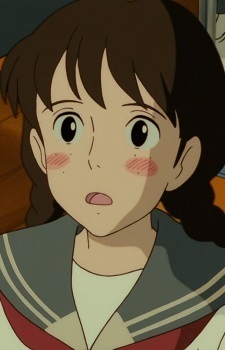 At the beginning of the movie, she was shown singing one of Shizuku's songs, and then admitting to her, that she has a crush on a boy named Sugimura. She receives a love letter but is lost because she does not return the feelings to the one who sent it to her. She doesn't reply for a while, so the boy sends Sugimura (Yuuko's actual crush) to go ask for her answer. This upsets her, and thus causes her to yell at Sugimura. Later, it is revealed that he actually really likes Shizuku, but Shizuku doesn't reciprocate these feelings, and rejects him. Yuuko never learns about this.